We both came to Maine as kids with our families and, we were lucky enough to bring our own children here. From snowshoeing in the backyard to swimming at Popham Beach, it really is a great place to raise a family. Frederic and Janet Chapin are now accepting essays in exchange for the opportunity to own their custom home, with 6,000 plus square feet of living space. The house is set on four wooded acres in West Bath, a quintessential town of 2,000 that sits between Casco Bay and the New Meadows River. The Chapin property boasts many amenities, including a free-standing guest house, greenhouse, sauna, heated garage, custom-built harvest table, fieldstone flooring in the four season great room, and raised beds for flower and vegetable gardening. The home is located in a private, rural area, just a 40-minute drive to Portland. West Bath abuts the historic City of Bath, a 19th century shipbuilding center and present-day home to Bath Ironworks and the Maine Maritime Museum. Bath was named one of “America’s Dozen Distinctive Destinations” in 2005 by the National Trust Historic Preservation and was one of five cities nationwide to receive the prestigious Main Street Award. The greater Bath area offers easy access to boating and water sports and serves as the gateway to Maine’s mid-coast region. The theme of the contest is The Maine Objective. To enter, submit an essay describing how this dream home in West Bath will help you achieve your Maine Objective. Essays must be 300 words or less; the price of entry is $140. Enter online at http://www.winamainehouse.com by June 20, 2016 at 11:59pm. In the event the minimum number of 4,200 entries is not met, all but $25 of each entry fee will be refunded. To ensure anonymity, the essays will be read by impartial judges with no ties to the property. Official rules for the contest are available online at http://www.winamainehouse.com. 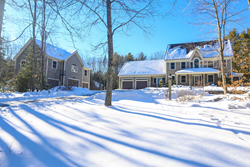 Frederic and Janet Chapin are accepting entries in “The Maine Objective” essay contest in exchange for the chance to receive the deed to their home in West Bath, Maine with more than 6,000 plus square feet of living space. For more details, Official rules and to see photographs of the home, visit http://www.winamainehouse.com or follow the contest on Facebook at https://www.facebook.com/TheMaineObjective/. Enter online by June 20, 2016 at 11:59pm. Essays must be 300 words or less and include a $140 entry fee.